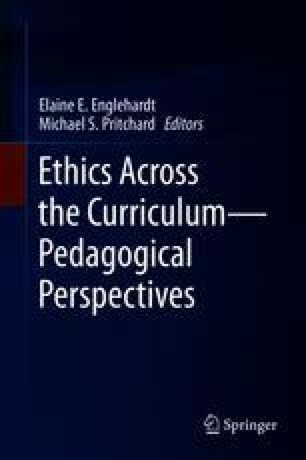 The piece argues that there is a connection between academic integrity (AI) and teaching ethics across the curriculum (EAC) that extends beyond shared terminology in a practical and purposeful way, i.e., in a way that is responsive to a challenge in practical and professional ethics. The twofold purpose of the essay is (a) to explain how linking AI and EAC is responsive to this challenge and (b) to make the case for the approach it involves. Two large questions are addressed. The first is about how EAC should be done, if it is connected to AI. The second (two-part) question is (a) What would success look like? and (b) How would we know that it had been achieved—how would it (success) be measured? The first concern receives the lion’s share of attention and involves taking cues from Jonathan Haidt’s social intuitionism and writing about logic and the law by Oliver Wendell Holmes Jr., and, in particular, John Dewey. Several considerations that argue for the connection are discussed before the two-part question about success is addressed in the conclusion. American University in Cairo. (2010). Academic integrity and its impact on business ethics. In Fostering Academic Integrity Conference, American University in Cairo, Egypt, December 5, 2010. AUC site: http://conf.aucegypt.edu/FAI10. Accessed September 25, 2017. Ariely, D. (2017). Ethical Systems.org. http://www.ethicalsystems.org/content/dan-ariely. Accessed September 25, 2017. BNP Statement. (2014). BNP Paribas announces a comprehensive settlement regarding the review of certain USD transactions by US authorities. https://group.bnpparibas/en/press-release/bnp-paribas-announces-comprehensive-settlement-review-usd-transactions-authorities. Dewey, J. (1924). Logical method and law. Cornell Law Review, 10, 17–27. http://scholarship.law.cornell.edu/clr/vol10/iss1/2/. Accessed September 25, 2017. Fahrenthold, D. (2016). Trump recorded having extremely lewd conversation about women in 2005. The Washington Post. https://www.washingtonpost.com/politics/trump-recorded-having-extremely-lewd-conversation-about-women-in-2005/2016/10/07/3b9ce776-8cb4-11e6-bf8a3d26847eeed4_story.html?postshare=2491475870527101&tid=ss_tw&utm_term=.562469574057. Accessed September 25, 2017. Gillen, D., & Hodge, C. (2014). Business behaving badly. The New York Times. https://www.nytimes.com/video/business/100000002614034/business-behaving-badly.html?playlistId=100000002585027. Accessed September 25, 2017. Harris, C. (2013). Banks have been fined nearly $3 billion by the SEC and have spent $66 billion on litigation, but one major bank hasn’t paid a dime and expects to pay $0 in litigation this year. International Business Times. http://www.ibtimes.com/banks-have-been-fined-nearly-3-billion-sec-have-spent-66-billion-litigation-one-major-bank-hasnt. Accessed September 25, 2017. Holmes, O. W., Jr. (1897). The path of the law. Harvard Law Review, 10, 457. http://www.constitution.org/lrev/owh/path_law.htm. Accessed September 25, 2017.
International Center for Academic Integrity (ICAI). (2014). Fundamental values. http://www.academicintegrity.org/icai/assets/revised_fv_2014.pdf. Accessed September 25, 2017. Otten, L. (2010). Does the punishment fit the crime? https://www.lasallenonprofitcenter.org/does-the-punishment-fit-the-crime/. Accessed 25. Prentice, R. (2015). Teaching behavioral ethics. Journal of Legal Studies Education (February 2, 2014). Available at SSRN: https://ssrn.com/abstract=2389689. Roston, M. (2015). Retracted scientific studies: A growing list. The New York Times, May 28, 2015. https://www.nytimes.com/interactive/2015/05/28/science/retractions-scientific-studies.html?_r=0. Accessed September 25, 2017. Touryalai, H. (2014). BNP is just fine after $9B penalty. Are billion dollar settlements effective? Forbes. July 1, 2014. https://www.forbes.com/sites/halahtouryalai/2014/07/01/bnp-is-just-fine-after-9b-penalty-are-billion-dollar-settlements-effective/#4b8a1eca28d7. Accessed September 25, 2017. Wueste, D., & Fishman, T. (2010). The customer isn’t always right: Limitations of “customer service approaches to education, or why higher education is not Burger King. International Journal for Educational Integrity, 6(1), https://www.ojs.unisa.edu.au/index.php/IJEI/article/view/672/499. Accessed September 25, 2017.